Cobblers boss Keith Curle has spoken of his delight at teenager Morgan Roberts’ call up to the Wales Under-21s squad for a training camp, and praised the youngster’s ‘exemplary’ attitude. The 18-year-old is training with former Cobblers boss Rob Page’s squad in Monmouthsire this week, before returning to Town duty on Friday ahead of Saturday’s trip to Cheltenham Town. Academy graduate Roberts was handed a three-year contract by then boss Dean Austin last summer having impressed in the youth team and in senior training, and he has been on the fringes of the first team this season. Since Curle took charge in October, Roberts has continued to impress and has made four substitute appearances for the first team, including three in league two, and Curle says his Wales call up is a sign of the player’s development. “His selection shows progression, and with Robert Page being the manager there he will have had a brief insight into Morgan,” said Curle. “We have had Morgan in training with us from day one since I came into the football club, and he perhaps hasn’t had as much game time as I would have liked. “He has gone through peaks and troughs with his training, and adapting to a new style and a new philosophy, but ultimately he has been one of the younger players that stood out when I first came in. “He is able to manipulate the ball, he is able to go past players, and the lad has an eye for goal. “Physically he needed to go on a strengthening programme which he is adhering to, and if you look at him now he is filling out, he is maturing, and he has a better understanding of what is required in the number of positions he can play. “He is naturally left-footed, but he can play left, right, and he can play in behind the striker as well. “Morgan just needs to come out of himself a little bit more, and to be a little bit more expressive on the ball, because I think the lad has more ability. “When he goes down a level and goes back to playing with the youth team, then he grows an inch, and it is about getting that confidence in him, and getting him comfortable in the environment. 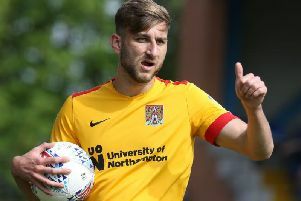 As well as being involved in the first team, Roberts also played a key role in the Cobblers Under-18s winning their league title before Christmas, and still features regularly for Jon Brady’s team when he is not required by the first team. And Roberts’ attitude when he drops back down to youth football has impressed Curle, as has the attitude of other youngsters who have tasted first-team action this season. “I think the pleasing thing about Morgan is how he has integrated into the first-team group, but also then when he has been asked to step back down to get game time, and even training time sometimes with the youth team, his attitude has been exemplary,” said Curle. “He has gone in there and maintained first team standards, and I think that is important. “It’s the same with some of the other youth-team lads that have been elevated to first team professional levels, and then have gone back down, they have gone back down with the right attitude. “That shows a good understanding of what is required. “They are not thinking that because they have trained with the first team they can go back down to the youth team and be loose, or a little blasé, because we don’t want that. “The players are on a development programme, which at times they will be training with the youth team.